Honestly, doesn’t everything taste much better when it’s wrapped in bacon? 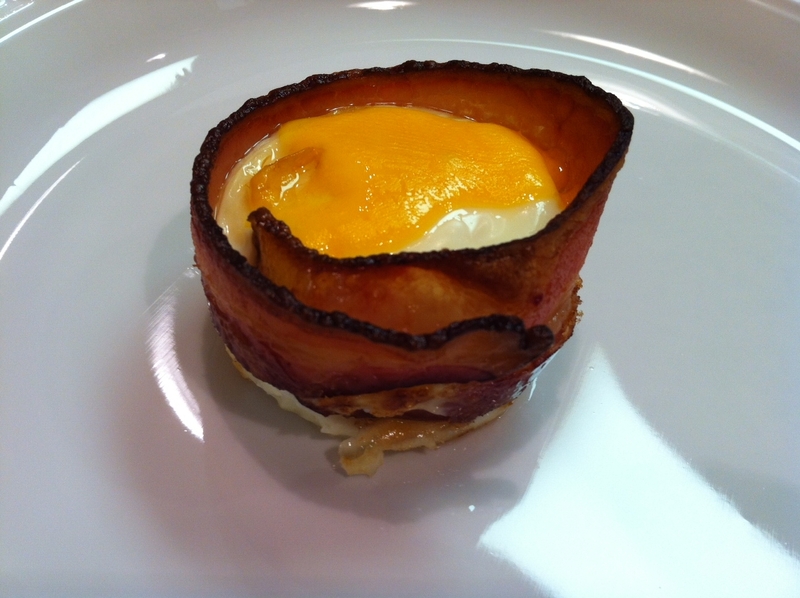 I’ve tried some variations of this recipe, and the key to creating this little piece of heaven is the bacon. Now, don’t go to your local grocery store and pick up any of that prepackaged bacon because that will not do this recipe justice. Go to your local meat market or a place that is able to slice your bacon fresh. Make sure to get the apple wood smoked bacon as this just adds so much more flavor of this recipe. If you have the opportunity to get the bacon thick cut, do so! It creates a crust around the egg, and just makes this recipe delicious. This soon will become a staple in your household, as it has in mine. 1. Preheat the oven to 400F. Spray muffin tin with cooking spray. 2. Line the metal baking sheet with foil or parchment paper. the bacon until they are 2/3 of the way cooked and flexible. 4. Line the muffin pans with the bacon so that it circles each mold. 5. Break an egg into the center of each mold. additional 2 minutes until the cheese is melted. This entry was posted in Uncategorized and tagged apple wood, Bacon, Breakfast, Brunch, Egg, local grocery store, muffin pans, muffin tin, parchment paper, Recipe, Recipes. Bookmark the permalink. This sounds soooo good. I’m going to try it over the weekend or something. Thanks for the recipe! Oh my, this looks yummy.